On September 26th 1991 six explorers stepped through an airlock and begun an adventure that would last over two years, and along the way subject them to severe psychological torment and starvation of both food and oxygen. The project was the operation of the first man-made biosphere, Biosphere 2, and involved an entire ecosystem being designed, constructed and hermetically sealed-off from the rest of the world; an experiment into the feasibility of using life itself as the life-support system to keep humans alive in space. The Human Experiment tells the incredible tale of what came to be known as ‘Spaceship Earth’ or ‘Garden of Eden’, written by Jane Poynter who saw it all from the inside. Poynter tells us that designing an artificial ecosystem that captures the essential essence of the original biosphere on Earth (‘Biosphere 1’) was much like playing Noah, choosing which organisms could be assembled into a stable self-sustaining network and then bottled in an enclosed environment. A vast greenhouse-complex was built in Arizona using a total of 6,600 panes of glass and over 60 miles of seams that had to be sealed flawlessly – on completion, Biosphere 2 had a lower leak rate than the space shuttle. Before closure, when the six ‘biospherians’ were sealed within their living building, the longest anyone had attempted to support themselves off a self-contained biological system had been a matter of days, and no-one knew how stable such artificial ecosystems could be constructed. Would such a small biosphere even be viable – would nutrients bottleneck and become locked-in without geological processes to cycle them? Would undetected toxins build up and before lethal? With contained viruses and bacteria, would humans rapidly succumb to deadly lung infections? Sure enough, the biospherians did encounter several ecological crises. Within such a small ecosystem the level of carbon dioxide in the air was extremely sensitive to the balance between photosynthesis and respiration and fluctuated wildly, soaring to dizziness-inducing levels on a cloudy day. There was the constant threat of crop failure due to unchecked pathogens, and most serious of all the oxygen began to mysteriously disappear from within Biosphere 2. The book contains a wonderful section where Poynter describes the efforts of her biospherian boyfriend, Taber, as a ‘molecular detective’ trying to work out what might be consuming the oxygen within the sealed environment. By January 1993 the level of atmospheric oxygen in Biosphere 2 had dropped below 14%, beyond the point where the air masks drop down on a passenger jet. The biospherians’ bodies adapted to the low oxygen in a completely unexpected way – more akin to that seen in hibernating animals than humans living at high altitude. The major results to come out of the Biosphere 2 project were not, however, with the study of ecosystems and nutrient cycling, nor the adaptation of human physiology to the harsh conditions, but in psychology. It was personality clashes within the pressure-cooker environment within Biosphere 2 and the conflicts between management and biospherian that almost caused the failure of the entire project. Poynter tells the story from her unique insider’s perspective, and the feeling of intense isolation often felt by the biospherians comes across potently. 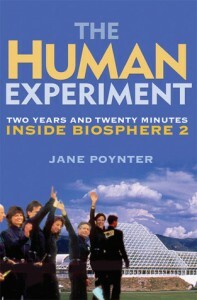 The Human Experiment is beautifully written, and so much more than simply a diary of Poynters stay within Biosphere 2. The book strikes a good balance between describing the history of the unique collection of individuals that came together to build Biosphere 2, explaining the science behind the design and construction of the project, and her intensely emotional experiences over the two years of closure.